Last weekend, Terrain was ground zero in the Great Osprey Outcry. 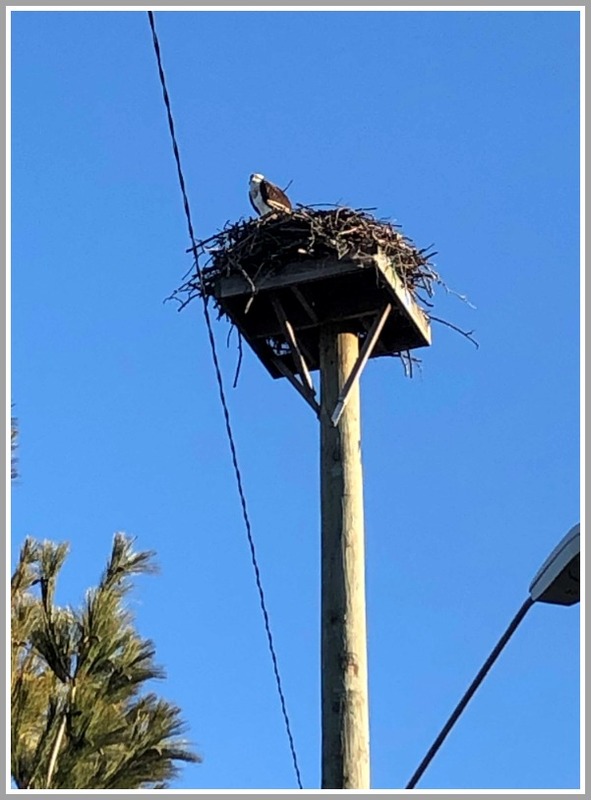 Employees were the first line of defense, when workers hired by Regency Centers came to remove the osprey nest perched on a pole on the border between the Fresh Market shopping plaza, and Terrain next door. The nest is back. But Terrain is moving forward. The garden-and-much-more store hosts an evening of education about the remarkable birds. It’s this Tuesday (April 9, 6 to 8 p.m.). Speakers include Charlie Stebbins and Milan Bull from the Connecticut Audubon Society and Osprey Nation, and Christine Peyreigne of Christine’s Critters birds of prey rehabilitation center. The goal is to provide a forum for education and volunteerism. The event is free and open to the public. There are complimentary snacks, and a cash bar. No word on whether the ospreys will swing over to say hi. It appears now that Regency Centers — the owner of both the Fresh Terrain shopping plaza and Terrain — is the bad actor in yesterday’s removal of an osprey nest on a pole between the two properties. Regency’s management company — or a sub-contractor — took down the nest. When confronted by Terrain employees, they claimed to be Audubon Society workers. They also did not have a permit from the state Department of Energy and Environmental Protection. A permit is mandated by the Federal Migratory Bird Act of 1918. But here’s where the story gets really interesting. This Thursday, April 4 (7 p.m., Town Hall), Westport’s Planning & Zoning Commission has a regularly scheduled meeting. In other words: The illegal osprey nest removal in preparation for parking lot work was done prior to P&Z approval. Regency Centers — owner of the Fresh Market plaza — will ask the P&Z on Thursday for permission to make changes to the facade and parking lot. And here’s where the story gets even more interesting. Thursday’s meeting is a public hearing. Westporters are welcome to attend — and speak. Regency is well known to Westport — and the P&Z. When Regency bought the Fresh Market plaza, they promised to plant trees in front, and install a sidewalk. That has not yet been done. Regency also owns Compo Acres Shopping Center (anchored by Trader Joe’s). Westporters — particularly those living behind the back parking lot — have not forgotten the work-first-ask-questions-later job done on the retaining wall there. A similar incident occurred in the back of yet another property owned by Regency: the shopping center across the street from Fresh Market. Thursday’s P&Z meeting should be very interesting indeed. The photo taken by the high school freshman of the bucket truck yesterday tells this old utility veteran several things. This is a “streetlight” pole, set exclusively for mounting the 2 streetlights clearly shown in the photo, whose lights provide security lighting for Fresh Market’s parking lot. All streetlights are supplied by secondary wires, energized 100% of the time. So this pole has active power supplied to it — a safety hazard for anyone choosing to work on this pole top. The utility always works with safety most paramount. If this contractor wanted to take this action they should have contacted the utility well in advance to get approval. Since the utility erected the platform originally. I assume they would never have granted approval for this action. They also would never allow this contractor to work on their pole without authorization, and proof that the contractor is “qualified” to work on energized equipment. Looks pretty clear that regardless of what DEEP or Audubon said to this contractor, they were also violating various rules and regulations of the utility and perhaps should be treated accordingly. License revocation? Fines? Local Westport electrical inspector might also be someone to get involved with this in that regard. This afternoon’s “0688o” story on the removal of the osprey nest between Fresh Market and Terrain struck a nerve. We’ve already received over 50 comments. They range from distressed and sad to furious and vindictive. The Audubon Society yesterday received a call asking about removing the nest. They emphatically said no, for many reasons. This morning, someone claiming to be from the Audubon Society told Terrain they were removing the nest because of upcoming construction — and then did so. Terrain apparently was duped. Fresh Market had nothing to do with the removal either. Store personnel are very upset about what happened. The state Department of Energy and Environmental Protection (DEEP) is involved. So are the Westport police. 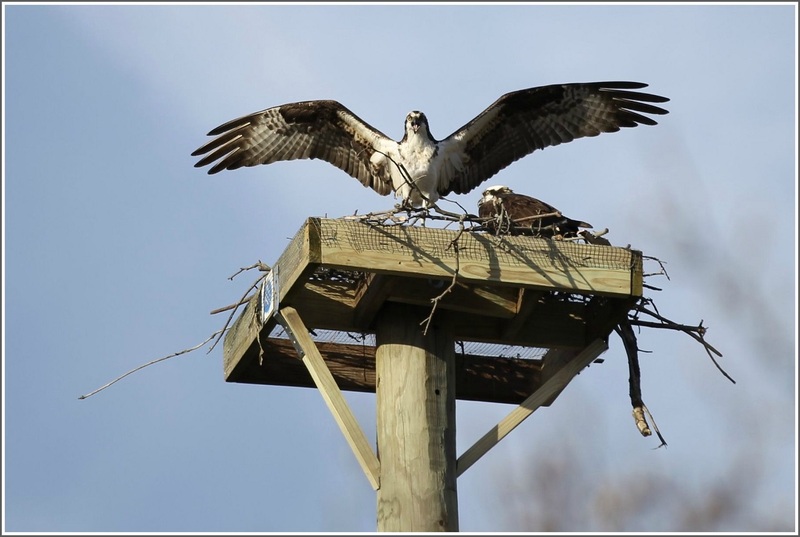 Tina Green: I just heard from Patrick Comins, executive director of the Connecticut Audubon Society, And they had nothing to do with the removal of the nest. The landlords should not have removed the nest and platform! Christine Cummings: I am an assistant manager at The Fresh Market and I want to assure you, we had nothing to do with the removal of the Osprey nest. We are as distressed. We have called the landlord and are trying to get an answer. Debbie Zager: This was done illegally – I went to walk around to see if Nest had been moved and found Betsy, a Wildlife Rehab person who had called in the DEP. The DEP is investigating – we looked everywhere and cannot find the platform. The Ospre’s are stressed and she is very concerned that this will be completely deleterious to the pair. Nobody had permission to move the nest and she said it was the worst time of year to even consider doing so. Calls to landlord went unanswered. Is there any video footage of the people who moved it on someone’s security camera? This is illegal – birds are protected by Federal Government. Contact Christine Peyreigne : christinescrittersinc@gmail.com a Wildlife Rehabilitator with info or to Report if you see an Osprey so distressed and tired that they are in the ground. Pete Reid: Hi, Dan. Managers at Terrain claim that the nest was removed by the Audubon Society with the approval of CT DEP. This surprised us, and I have reached out to Audubon and DEP to try to confirm this. It would be a violation of Federal law to destroy a working osprey nest, and this sounds like a working nest. I would say this is a story worth looking into. WASA has been very helpful in getting the word out on this. Regards, Pete Reid, Wildlife in Crisis, Weston. 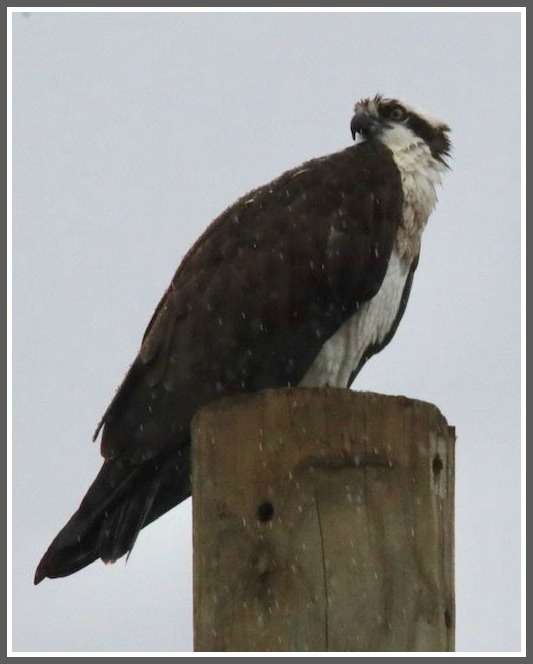 Betsy Peyreigne: After numerous phone calls from people concerned for the osprey, I went down to check out what was going on. 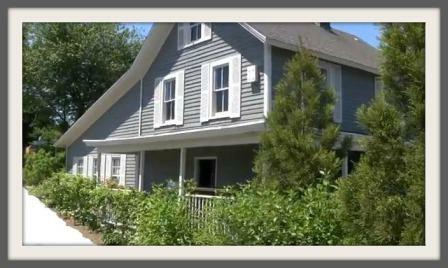 I spoke to Audubon in Fairfield who made calls and confirmed that it was NOT Audubon who removed the nest this morning. They received a phone call yesterday asking their opinion on removing it and they firmly stated that it should NOT be touched or removed. The DEEP is investigating. Leslie Riback: I just called Terrain again and spoke to manager Maureen. She told me that the police dept and DEP are now involved. She admits that they were misinforming the public by telling them it was removed by the Audobon Society. She says the men who came and took it down told them they were “biologists”. Our phone call was cut short as she said the DEP was calling on the other line. I guess this is now in the hands of the DEP. Can this get rectified quickly enough? I wish there was more I could do…. Alissa Harrison: I can confirm the CT Audubon Society’s Director of conservation was contacted just yesterday by the construction company involved and the official recommendation was to leave the platform as the osprey pair that nests there are habituated to all of the human activity and would not be negatively effected by the construction. The Audubon immediately contacted the DEEP biologist in charge of monitoring osprey. An Audubon employee was not in any way involved in the removal this morning, it was done solely by the construction company going against the official recommendation of the CT Audubon. I’m happy to hear DEEP is investigating the matter further and hopefully the platform can be put back in place ASAP. It is my understanding that a nest can be removed as long as there are no eggs but that certainly doesn’t mean it should be especially in this situation. Thank you Betsy for your continued work to get to the bottom of this! Former Eversource employee: Pole is Eversource property…they only allow their own crews or contractors they hire, to install or remove anything on their poles…this is clearly a violation of their rules which all municipalities support and take action against any violators – suggest getting Town of Westport involved. This violates NatIonal Electric Safety Code – thus coming under municipal jurisdiction for enforcement! 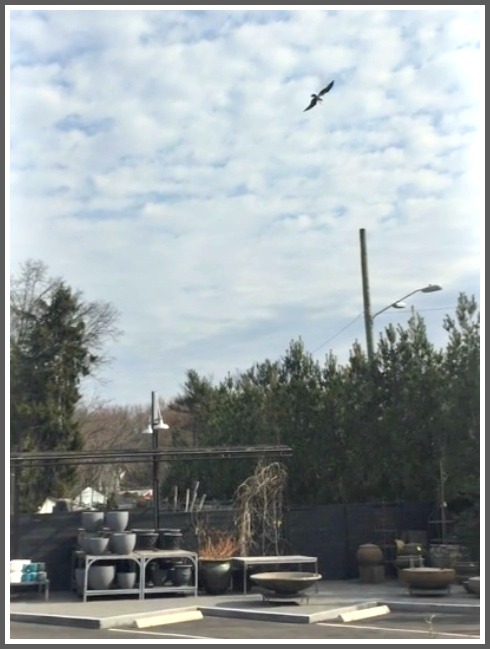 Debra Zager: Does Terrain know the name of the landlord because the cherry picker construction device in the back parking lot of Fresh Market (and where Terrain is busting through building) has the keys still in it and it is the machine used to remove the nest. Someone told a worker at Fresh Market that they were relocating the nest for safety due to the upcoming construction … Ridiculous! Does Terrain have Security Cameras or Fresh Market ? If so- perhaps they can identify who did this early this morning? An officer from DEEP came to Terrain & I shared my entire story with him. He assured us that he would get to the root of this. Terrain management kept this as a priority throughout the day & into this evening. & is active in doing everything possible to see that the Osprey are protected & that the nest is replaced as soon as possible. It has been a most heartbreaking day for all of us at Terrain. Lauren Aber: I’m the store manager at Terrain. We are as upset as everyone about the removal of the Osprey nest. Although the nest does not sit on our property, the birds are very important to us and we look forward to their return every year. We have contacted the EPA, who sent on officer out to the store. They are conducting an investigation and I will update this post with their findings. Richard Hyman: Can we erect a new platform tomorrow, Sunday? Birds in distress. The latest Westport trend is: dogs in stores. And we’re seeing it more and more. These 2 women conducted a lengthy checkout. The entire time their Lab licked and nibbled the holiday packages of chocolates and peppermint bark on the lower shelf. 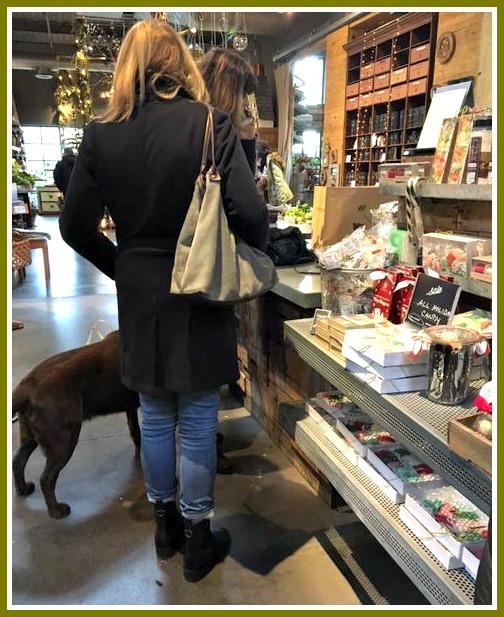 When the transaction was complete, the women and dog grabbed a choice table in the Terrain Cafe. I reported what I saw to the cashier, who seemed completely disinterested. She did say she would remove all of those boxes of candy from the floor. I did not stick around to see if she made good on her promise. But imagine if I hadn’t reported this? Some innocent shopper would give quite a gift: a very germ-y box of candy. They Grow Up So Fast These Days! 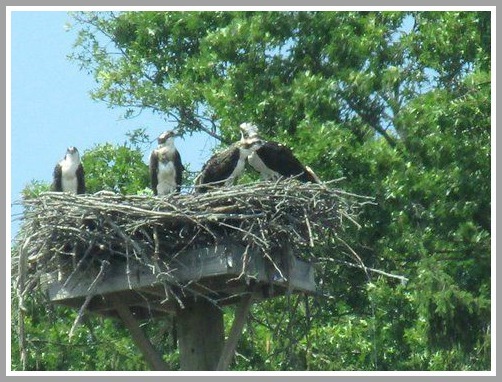 For the past few years, Westporters have marveled at the ospreys that live between Fresh Market and Terrain. The proud parents now have 2 youngsters, almost ready to leave their high home. Hi ! I am planning a trip to Westport because of Terrain, and want to find some other unique spots. I have never been to Connecticut. Do you have any must- sees? Our interests are flea markets, breweries/ wineries, photography, cafes. Any feedback would be appreciated. Thank you much! This calls for crowd-sourcing. Alert “06880” readers: Help our visitor out. Click “comments” to recommend your must-sees. Explain why, too. Let’s provide an overwhelming number of choices. I promise to follow up, with a full report on how the visit went. For photography, I recommend the Westport Arts Center’s current exhibit of Lynsey Addario’s astonishing shots celebrating Afghan women. 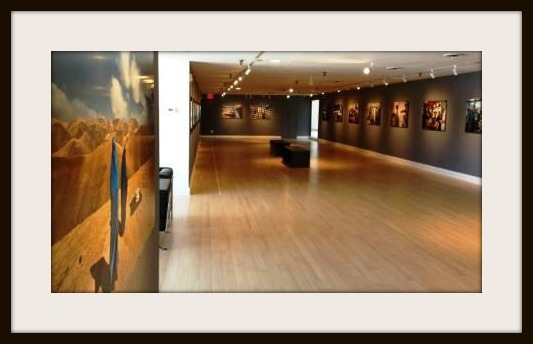 Our visitor will find the WAC a fascinating place — with great photographic opportunities outside too. Tomorrow (Thursday, July 18), the Planning & Zoning Commission will consider a new plan from Terrain. It will save the 1900-era house on the corner of Post Road and Crescent Road; will increase the store’s parking by 29 spots, and will move off-loading of trucks from Crescent Road to their own property. Sources say 8:15-ish is the best time to get there for the Terrain application. If you can’t attend the meeting, contact P&Z director Larry Bradley (lbradley@westportct.gov). He’ll put all emails in a file for P&Z members to read. The house on Terrain’s Post Road property, at the corner of Crescent Road. Then, on Thursday (July 25, 7 p.m.) the P&Z will review use of town land, as it relates to the relocation of the Kemper-Gunn House (35 Church Lane). RTM member Matt Mandell has organized an online petition, in hopes of convincing town bodies to move the building a few yards away, to the Elm Street parking lot (prior to construction of Bedford Square). Finally, there’s the Saugatuck firehouse. On Wednesday, August 28, the RTM Long Range Planning Committee will hear public input on possible relocation sites. And you thought you had the summer off! Sources say that Terrain has asked that its request for demolition of the house on the corner of the Post Road and Crescent Road be removed from tonight’s Historic District Commission agenda. Terrain is believed to be working with the Planning and Zoning Commission on a parking plan that would preserve the century-old structure. One of the owners of the property leased by Terrain opposes the store’s request to demolish the 1900-era house, and replace it with parking. I am one of the owners of this property. (According to attached Court proceedings), the entire lease of Terrain is in question, as well as who is authorized to act for the property in granting Terrain permission to do any renovations. 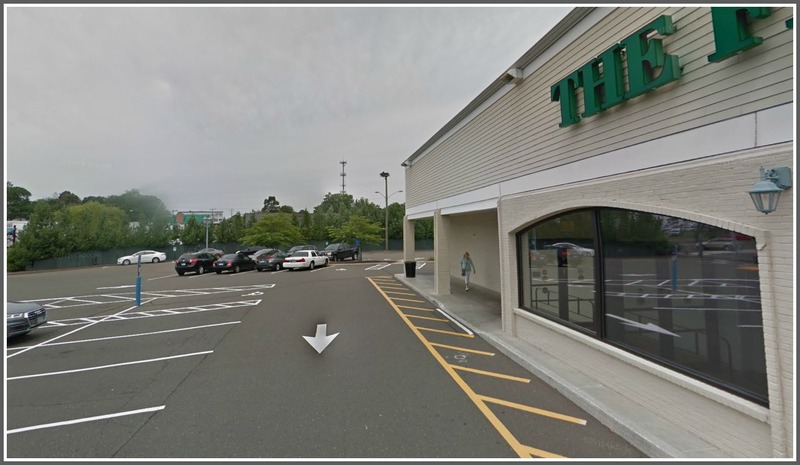 The combination of 535,541 and 561 Post Road that was done to satisfy the zoning footprint for the original Terrain application is also in question, as well as the (legal) action in doing it. My family has made numerous commitments to the Town of Westport over the years to not tear down the old “Dress Barn.” Curran Cadillac may still be standing if we were able to expand to meet General Motors’ requirements. That property has had and will continue to have parking concerns forever. The Terrain lease is only guaranteed for another 9 years, while the demolition of this building is permanent. The tax rolls will be reduced. Since the parking is wanted for the restaurant of Terrain, would the original application have been granted if it were for a restaurant and not a nursery? In 2011 — as part of its application process — Terrain agreed to preserve the small house at the corner of Crescent Road. The Historic District Commission and Planning and Zoning Commission liked what they heard. The small, gray 1900-era building — one of the last examples of a single-family house on the Post Road — stood proudly across from the fire station. But parking is tight at the garden center/lifestyle emporium/restaurant. And it’s tighter than it should be, because as part of the permitting process, the P&Z gave Terrain great latitude with its spots. The Urban Outfitters-owned store was allowed to show 48 parking spots that could be used, if needed. In the plans, they were shown on the east side of the building — near Fresh Market. They’re currently used to display plants, pots and other garden equipment. 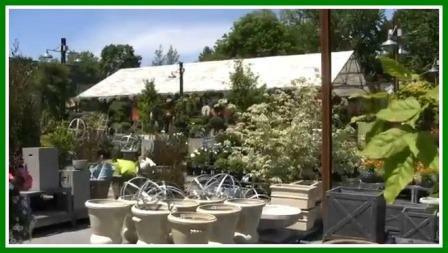 Terrain’s “reserve” parking spots, currently used for plants and garden equipment. Meanwhile, Terrain plans to knock down the house — and gain 8 parking space. The request for demolition is on this Thursday’s P&Z agenda (June 13, 7:30 p.m., Town Hall auditorium). Terrain is also on tomorrow’s Historic District Commission agenda (Tuesday, June 11, 7 p.m., Town Hall). Matthew Mandell is not pleased. The RTM District 1 representative has made a video, and posted it to YouTube. In it, he explains the back story of Terrain’s dealings with the town. Also in the video, Randy Henkels of the Historic District Commission notes their early support of Terrain, based on promises the store made. Town planning director Larry Bradley describes his department’s role. And RTM member Cathy Talmadge suggests a boycott of Terrain, if they press ahead with demolition plans. At the end of the video, Mandell urges Westporterswho want the building saved to write lbradley@westportct.gov. Bradley will pass emails along to P&Z members. Eternal vigilance is the price of preservation.